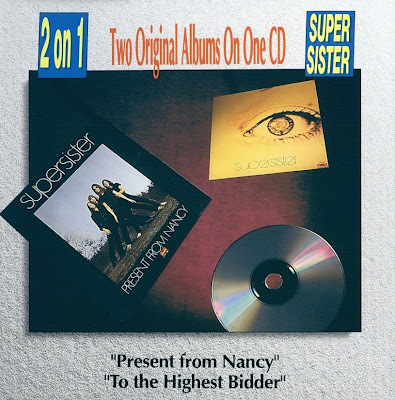 I have two Supersister albums, Present from Nancy and Iskander. I've also heard parts of To the Highest Bidder and Spiral Staircase. To the Highest Bidder and Present from Nancy are generally the recommended starting places. Showing strong Canterbury (e.g., early Soft Machine) and some Wigwam influences in the organ department (lots of organ), Supersister blend their own Dutch ideals and a touch of humor into a unique mixture of progressive rock. Plenty of flute or sax or both can be heard weaving in and out of the varied organ and piano. Sax is very prevalent on Present from Nancy. On this album, and the similar ...Highest Bidder, the music doesn't sit still very long, shifting constantly through different times and keys yet always developing. When the lyrics are present, they seem breezy and carefree, even playful, the melody often echoed by sax or flute. There is no guitar. Iskander steps down a small notch. The sound continues on in the vein of Present from Nancy but the sax is gone. This helps to give the band more of their own unique sound. The flute is much more prevalent now. However, some of the writing is a bit weaker. There are fewer time changes and so forth. There are many excellent moments but a few times I noticed I wasn't "into it' as much as I was with Present from Nancy. It's also more experimental and meditative (i.e., spacy) for about half the album. Based on what I've heard of Spiral Staircase is the weakest of their albums. It seems they ran out of good musical ideas and relied more on the humor. One song is based on a rhumba! Supersister doesn't play the most complex music you might hear, but the first several albums are very good none-the-less. Supersister is a good band for Canterbury/UK fans to break into the Dutch and Scandanavian scenes. Start with the first album and work your way forward.